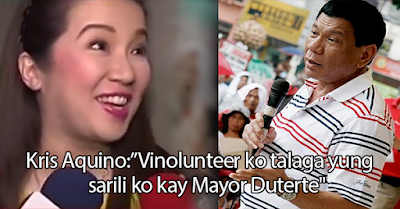 Watch: Kris Aquino Decided to Volunteer Herself to Mayor Duterte? Kris Aquino is known for being frank and sometimes tactless. She has been a subject of certain controversies, which made her more famous among the presidential sisters. Since she entered show business, the eyes and ears of all are on her because of her unique charisma. The Aquino family is known for supporting the "Daang Matuwid" candidates Mar Roxas and Leni Robredo. Kris even appeared in one of the campaign rallies of the tandem. However, the Queen of All Media is now on the hot seat because of her statement. She is now volunteering herself to Mayor Rodrigo Duterte. During an interview, she is very straightforward in saying she is willing to undergo an OJT under Duterte. Politics is really unpredictable. It is not an assurance that your alliance will be with you forever. Is Kris ready to enter politics? Is she really withdrawing her support to Mar-Leni? What do you think?